I took up a monitoring position 4.3 miles from the Mag. Rim. (Matt's Mt.) launch. Leaving the black top road and taking a county road SW for about half of a mile. This position, 144º heading from launch, gives a line of sight and also permitting radio reception. Even though the LZ is only one mile away from launch radio reception is blocked by the mountain we soar. I was on station at 10:00 am and Buzz Nelson checked in on the radio but then had to wait until 11:44 to launch his PG. We had full overcast and where I was the wind was 170º @ 5 to 7 mph. At 11:50 Buzz went out of sight at the bottom of the ridge so I headed toward the mountain on the blacktop and picked him up for the drive back up to get his car at the fence. That was a wild ride, Bill! I'm glad your landing was so good (and the takeoff was without incident). Every time, we learn something about that site. Good thing you weren't in a paraglider, Bill. In the "old days", when we didn't have rib battens in the glider's sail, conditions like those would cause sudden sail inversions. These would make very loud bangs! Talk about thinking the glider was coming apart! Now it's time for a relaxing flight day at Dockweiler Beach CA. Great high speed / high control and bar plant landing. Yes, that was worth waiting for. A dramatic clip to start my Tuesday morning with! And what the weekend brings, who can say? I think it will be flyable, though. Bill, that wasn't a crash. You planted the bar level and let the nose pivot forward. Textbook for turbulent LZ landings. Also, again, good speed to maintain control in the expected ground turbulence, and then bleed off the energy to drop down in your chosen soft spot. 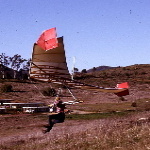 This is a good example of how the hang glider protects the pilot in turbulent landings. Whack: the wonderful sound of energy being harmlessly dissipated by the aircraft - instead of by the pilot!